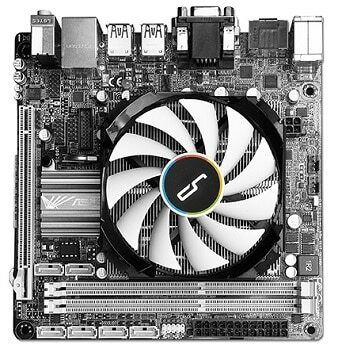 A Mini ITX gaming PC is not a common sight. They may be aesthetically appealing, compact, and easy to transport, but the ever-present problem with small form factor cases is cooling. A cramped case requires more airflow, and stock coolers that ship with most CPUs are only just bearable even in regular-sized cases, as they are far from efficient and tend to be obnoxiously loud. That’s where aftermarket low profile CPU coolers come in. If you’re building a Mini ITX gaming PC, getting a good cooler is a must. In this article, we will be bringing you the very best low profile CPU coolers of 2019! 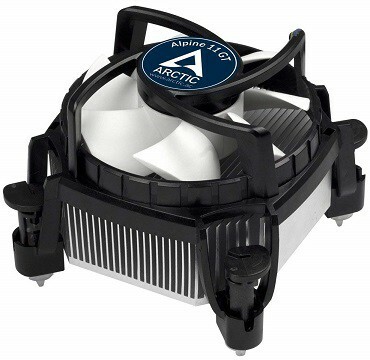 The Arctic Alpine 11 GT is a basic low profile CPU cooler that was already featured on our list of the best CPU coolers in general, and the same reasons why it landed a spot there are also what makes it the first entry here. It is not only very affordable but is also a small step up from most stock coolers. If you need a cooler that is quieter and offers a minor performance boost, all the while costing virtually nothing, then this is one is undoubtedly the right choice. As mentioned above, the Alpine 11 GT is a limited upgrade over an Intel stock cooler, at least in terms of performance. True, the denser heatsink does help with heat dissipation, but the biggest advantage that this cooler has over the stock one is that it is noticeably quieter. Apart from that, the only real downside is that this cooler is not compatible with the latest AM4 socket (or any AMD socket, for that matter), so it’s a no-go for Ryzen users. Next up, we have a pricier and more serious low profile cooling solution from Cryorig – the Cryorig C7. This product was designed specifically as an upgrade over a mediocre stock cooler, that much is evident from the product page itself. 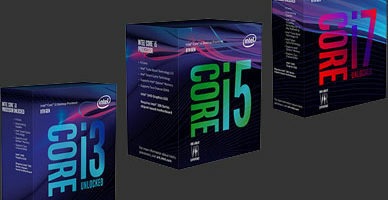 The manufacturer claims that the C7 offers temperatures 25% lower than those than an Intel stock cooler can manage, all the while being quieter and relatively the same size. Independent tests prove this claim mostly true, so what is the secret behind this cooler’s efficiency? In essence – copper heatpipes. Two of them, to be precise. 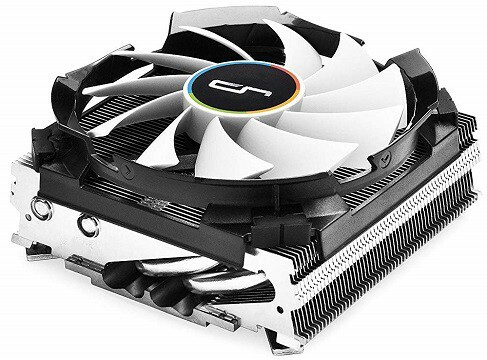 The Cryorig C7 presents great value for your money, there’s no doubt about that. It is a clear notch above stock coolers, both in terms of performance and noise generation, although it is still far from being the quietest cooler around when running at top speed. The biggest drawback to this cooler is nothing to do with the cooler itself, but simply the fact that it is not compatible with the AM4 socket out of the box, and a separate upgrade kit is needed. This is common for coolers that were released prior to the launch of the Ryzen CPUs, but even so, Cryorig issues free upgrade kits to those who can provide a proof of purchase, so you won’t need to pay extra. Other than that, the C7 performs admirably. Naturally, it won’t outperform any of the more expensive coolers, but it is definitely the best value cooler on this list if you’re looking for a solid upgrade that will not only bring down the temperature, but also noticeably reduce the noise levels when your PC is under heavy load. Naturally, we can’t talk about CPU coolers without mentioning Noctua, who are instantly recognized by their superb yet deceivingly cheap-looking fans. The NH-L9i cooler that we have here is everything that you’d expect a Noctura cooler to be: well-built, efficient, quiet, and unfortunately, a bit pricey. Still, this particular cooler is not exactly a performance-oriented one. Rather, its primary advantage over the similarly-priced competition is the extremely quiet fan. *AM4 socket requires a mounting kit, which is sold separately. 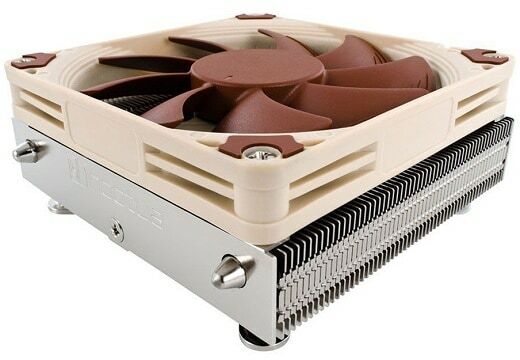 As mentioned in the introduction, this cooler’s main selling point is its low noise generation, something that’s pretty much synonymous with Noctua fans. In terms of performance, it is on fairly even terms with the slightly cheaper C7, but it is noticeably quieter. So, if you are easily distracted by noisy fans, consider the L9i over the C7, as the few extra bucks will definitely be worth it. Let’s not forget that fans have to work hard when paired with a compact heatsink, and this is all the more true when we put it inside a cramped Mini ITX case. On the other hand, if you actually don’t mind the noise, we’d recommend the C7 over the L9i any day of the week. Finally, another thing that the budget-conscious should consider is that, while neither this cooler nor the C7 support the AM4 socket without a separate mounting kit, Cryorig gives their mounting kits away for free, whereas with Noctua, you’d have to pay a few dollars extra. The Thermaltake Engine 27 is quite the eye-catcher, that’s for sure. 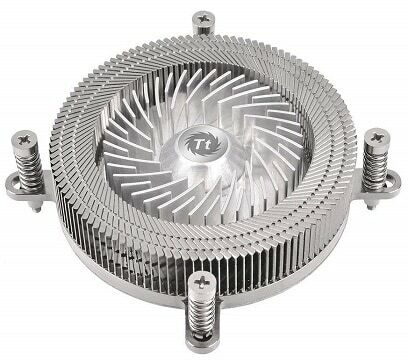 What seems to be nothing but a heatsink at first glance is actually a fully-functional CPU cooler, only the fan, too, is made entirely of aluminum. Even when we set the aesthetics aside, the cooler is still efficient, quiet, and is one of the most compact coolers out there. 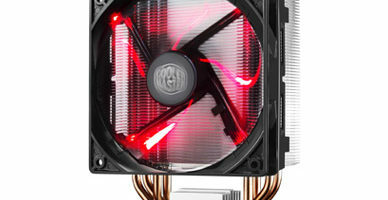 The Thermaltake Engine 27 is, undeniably, one great-looking cooler. The all-metal design is definitely not a common sight, and it is ridiculously small, even by low profile cooler standards. However, the aesthetics do come at the expense of performance. While the Engine 27 definitely takes the cake in the beauty department, the cooling performance is noticeably lacking behind the cheaper alternatives. Ultimately, it is a better-looking, smaller, and quieter cooler than the Cryorig C7, but the hefty price tag and the lacking performance do make it a rather dubious investment. 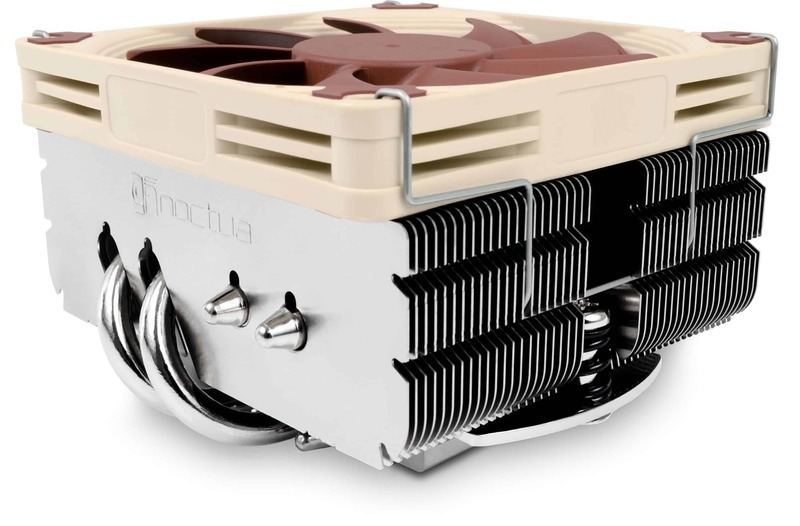 And for the final entry, we come back to Noctua, only this time, it is the NH-L9x65 cooler. It is virtually identical to the cheaper and more compact NH-L9i, except for one very obvious difference: the heatsink of this model is twice as tall. That extra bulk can mean only one thing: better cooling efficiency. And of course, since it’s Noctua and it is the same fan as the one shipping with the L9i, the L9x65 is also remarkably quiet. As a matter of fact, it is even quieter thanks to the larger heatsink, as the fan doesn’t have to spin as fast as that of the L9i. To put it bluntly, this is one of the best aftermarket coolers you can get if you’re looking for a cooler that can strike the golden balance between “efficient” and “quiet” in a Mini ITX case. Still, despite the extra bulk, it only remains a couple of degrees ahead of the significantly cheaper Cryorig C7, although that comes with the territory. You can rest assured, however, that the L9x65 will still perform better, and be significantly quieter while doing so. So, as with the L9i, the primary advantage of the L9x65, as well as the main reason why you might consider buying it, is the extremely quiet fan. Other than that, there are the same two issues as with the L9i – the cooler is fairly expensive and a mounting kit for the AM4 socket is sold separately. At the end of the day, our low profile cooler of choice would have to be the Cryorig C7. Sure, its fan is not as quiet as those that come with Noctua coolers, but when push comes to shove, the two are evenly matched. More importantly, the C7 is quite a bit cheaper than either of the two Noctua coolers listed here, and that’s definitely something to keep in mind. So, if what you’re looking for is a well-performing cooler to replace the lackluster stock one, the C7 should be your first choice. The only time that we’d definitely recommend a Noctua over it is if you just can’t stand loud fans. And true enough, if you’re building a Mini ITX gaming PC, chances are you are going to have some trouble with fan noise. And that would be it for our selection of the best low profile CPU coolers of 2019. If you’re looking for some extra cooling power to add to your build, check out our list of the best case fans as well!